This green smoothie is seriously thick! 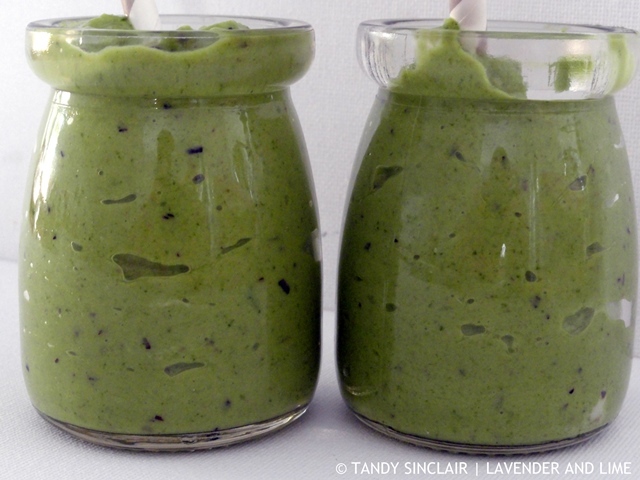 It is made by blending a variety of green fruit and vegetables and frozen grapes. These are always in my freezer to keep wine cold in summer. My blogging friend Tammy wrote a post called Spiralizing and the Sharing Economy. In it she spoke about how we seem to accumulate kitchen gadgets, some of which are seldom used. She contemplates the concept of having a site where people in the community can list what they have so others can borrow as needed. I am sure Lorraine would appreciate this as I know she has limited space in her kitchen and is often looking to borrow something she needs for a recipe. I too am a collector of gadgets. The least used one is my juicer as at present it does not have a home. Instead it lives on top of my fridge where it is not easy to get to. However, my blender has a space on the kitchen counter and this is why I am making more smoothies than anything else to drink at present. To make this green smoothie I stepped into my garden and picked some spinach leaves. There is nothing more rewarding than watching something grow and then making use of it. I loved the perfect balance of flavours without any one ingredient being more overpowering than the next. It is perfectly sweet and the addition of lime adds the tartness I love. Feel free to add more lime juice if you want, which is what i did when I poured my second glass. 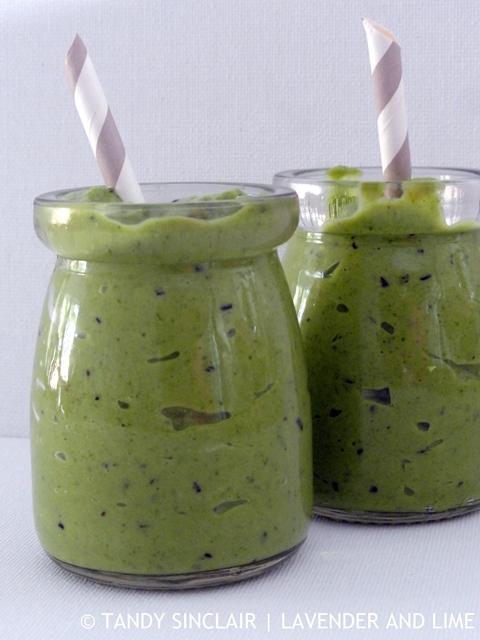 I am not big on green smoothies probably because the ones I had were not up-to the mark but I like this recipe never seen avocados and yogurt being used in green smoothie, will try it out for breakfast! I think I’m the biggest green smoothie lover on this planet. Can’t wait to make it for my breakfast tomorrow morning! 🙂 Could I also add some mango to make it a bit sweeter? How sweet of you Tandy! Thanks for the shout out! Love the smoothie. Hi Tandy, I need to start drinking smoothies again and this one looks fabulous. So thick! Love the colour. Love too that you also added in pear, as I adore the taste of pears. Lovin your tip too about keeping grapes in the freezer for cooling down wine. It has healthy written all over it and after all these holiday over indulgences a nice change of pace. I love a green smoothie. It’s so delicious and healthy. That is am unbelievably delicious looking and thick smoothie? Are you sure you do not need aspoon 🙂 ? Oh yeah gadget overload, I just tossed my cheap spiralizer recently actually. Sounds lovely and looks packed full of vitamins! Sounds fresh and nourishing, Tandy. Given those two results I am going to eat more spinach! My kids love smoothies in the morning. And how lovely that you could make yours with spinach you grew yourself. Love that! This must be very sharp with the juice of 2 limes. Nice combination of flavours.